Definition at line 25 of file NullSemantics2.h. Definition at line 36 of file NullSemantics2.h. Referenced by bottom_(), number_(), undefined_(), and unspecified_(). Definition at line 41 of file NullSemantics2.h. Definition at line 46 of file NullSemantics2.h. Definition at line 51 of file NullSemantics2.h. Definition at line 58 of file NullSemantics2.h. Definition at line 61 of file NullSemantics2.h. Definition at line 64 of file NullSemantics2.h. Definition at line 67 of file NullSemantics2.h. Definition at line 70 of file NullSemantics2.h. Definition at line 77 of file NullSemantics2.h. 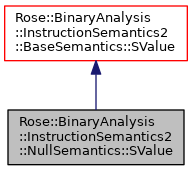 The value v must have a NullSemantics::SValue dynamic type. Definition at line 86 of file NullSemantics2.h. Definition at line 95 of file NullSemantics2.h. Definition at line 99 of file NullSemantics2.h. Definition at line 103 of file NullSemantics2.h. Definition at line 109 of file NullSemantics2.h. Definition at line 114 of file NullSemantics2.h. Definition at line 119 of file NullSemantics2.h.